Here is an overview of the achievements accomplished during EUFAR FP7 2008 - 2013. The major development for EUFAR during FP7 was the incorporation of a larger community working in the field of hyperspectral remote-sensing of the Earth’s surface. EUFAR already incorporated aircraft providing this capability but during EUFAR FP7 these were subject to a greatly-increased level of demand. To date, projects using these facilities have used approximately 55% of the flight hours allocated to successful proposals. In many cases, these projects are a good fit to the EUFAR capability since they are capable of acquiring suitable scientific data within the typical allocation of flight time that EUFAR is able to make. A new initiative introduced at the start of EUFAR FP7 was the active promotion of clustering together of TA projects, both with other TA projects and with nationally-supported activities. It is recognised that achievement of the scientific aims of a project requires the aircraft to be flown to a specific location. Clustering of related TA projects together reduces the number of unproductive transit flight hours that need to be borne by each individual project and enables a greater fraction of the flight time allocation to be used for productive data gathering. In other cases, the clustering of TA projects with nationally-supported activities serves to build a larger group of scientists working together in the field. This can be of benefit to the TA projects, many of which are focused on new or inexperienced users of airborne research facilities, since they are then able to interact with more experienced scientists. Another important development during EUFAR FP7 has been the move away from any fixed allocations of flight time to individual aircraft operators. TA proposals are judged by the User Group Selection Panel on their independently-reviewed scientific merit and flight time is allocated on the most suitable aircraft for the work proposed. This provides an incentive for aircraft operators to promote the availability of their facilities to new users and to encourage the submission of proposals that they may be able to support. To ensure that the scientific merit of TA proposals is of a consistent level, review criteria based on those of a national funding agency model were adopted. Two methods of assisting new or inexperienced users to develop the scientific quality of their proposals were adopted during EUFAR FP7. The first was the initial submission of a proposal to a pre-review phase in which it was available for comments and suggestions by both the aircraft operators and other EUFAR measurement experts. The other method was the submission of a short and simplified expression of interest in a particular measurement topic. These were circulated to all the aircraft operators listed on the EUFAR website (not just those available for TA) in order to give them all a chance to respond to the prospective user. These expressions of interest were successful, enabling a number of full proposals to be developed, several of which were subsequently successfully reviewed and secured funding. There has also been a significant increase in the EUFAR Scientific Reviewer pool during FP7, with 42% of the reviews received being from these new members. 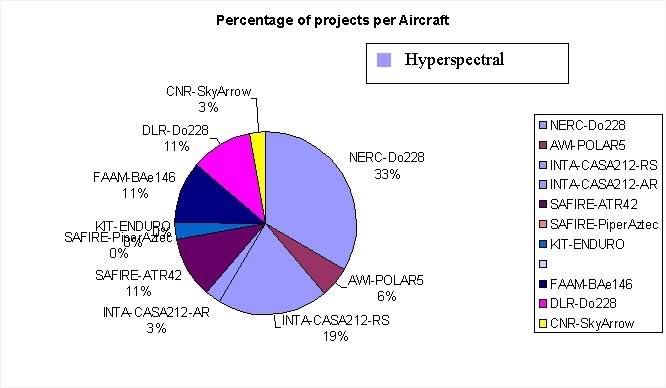 The use of stratospheric aircraft has been successful in the last 15 years in terms of technical developments, achieved scientific results in various fields and community-building and important scientific topics in atmospheric and climate research have been identified for the short- and midterm future which require the use of a high-altitude carrier with a ceiling higher than 15 km. The operation of a high-altitude aircraft is cost intensive as only special aircraft types can be used. We recommend a European approach, may be with support from one or more member sates, to make such aircraft available for European scientists. For campaign-based operations in the coming 5-10 years, an aircraft as the Geophysica, the ER-2 and WB57 are required. Due to limited ceiling and payload capacity, the Egrett is suited only for a small part of the identified measurement tasks. The Geophysica is the only aircraft that enables the European community to carry-out larger research programmes already in the next few years, provided that funding for the required overhaul can be allocated (several M€) and a new MoU will be agreed upon. German institutes under the lead of FZJ currently negotiate such an agreement with MDB. The advantage is that the comprehensive existing and certified payload can be used, and only integration of a few new instruments would be required. Thus, highest priority should be give to keep the Geophysica in service for European research. If this is possible, the Geophysica should be included in a new EUFAR project as part of the fleet for TA. The ER-2 and WB57 may serve as an alternative in case that the Geophysica is not available. WB57, however, is heavily booked for the coming years already. Operation costs of the ER-2 are lower, that of the WB57 are almost the same as for the Geophysica. An agreement with NASA has to be negotiated, preferably by a research organization in Europe. However, a European payload would have to be developed (or at least adapted from other research aircraft) and certified for the ER-2/WB57 which would require funding of several M€ and several years of work. If the ER-2/WB57 are considered as an option, a supporting programme granting such costs (new EUFAR JRA?) is required, as otherwise many groups, in particular Universities and partners from several countries, could not provide instruments to such an aircraft. The Global Hawk stratospheric UAV provides the opportunity for new research fields and is thus an innovative carrier in which the European science community expressed its high interest. Italy and the U.K. agreed on cooperations with NASA, and it would be desirable to extend these options to other EU countries and to a wider community. The use of the Global Hawk also requires an instrument development programme and thus aims for projects foreseen in several years (also depending on U.S. programmes). This text is an extract from the white book "Stratospheric Aircraft in Europe" written in August 2011. The full PDF version is available here. This book summarizes the knowledge of 83 of the most reputed, international experts in airborne measurements from 13 countries which is based on many years of airborne field experiments and application to environmental research. The book is produced within the framework of the EUropean Facility for Airborne Research (EUFAR) (http://www.eufar.net/), a research infrastructure network supported since 2000 by the European Commission (EC), as part of the research infrastructures integration program (http://cordis.europa.eu/fp7/capacities/home_en.html). One of the EUFAR Networking Activities is dedicated to Expert Working Groups (EWGs) which facilitate cross–disciplinary fertilizations and a wider sharing of knowledge and technologies between academia and industry in the field of airborne research. For this purpose, over the last ten years numerous workshops have been organized dealing with technical, logistical, and scientific issues specific to airborne research for the environment. From the beginning, these workshops involved international experts but ever increasing numbers of scientists from outside the European airborne science community have become involved and played an active role. Thus, the EWGs within EUFAR have become a truly international effort and the workshops have a major impact on defining research foci of future international airborne research. The EUFAR EWGs currently publish workshop reports and recommendations to aircraft operators on best practice and common protocols for operation of airborne instruments, to scientific users on best usage and interpretation of the collected data, and to the research institutions on future challenges in airborne measurements. To ensure legacy of this accumulated knowledge, this book summarizes the EWGs activities and has been designed to provide an extensive overview of existing and emerging airborne measurement principles and techniques. Furthermore, the book analyzes problems, limitations and mitigation approaches specific to airborne research. The first Chapter 1 examines strengths and weaknesses of airborne measurements. The subsequent Chapter 2 deals with the description of instruments to measure basic thermodynamic and dynamic parameters of the atmosphere. The next group of three chapters considers in situ measurements of atmospheric constituents (Chapters 3–5). Chemical airborne instruments of gaseous atmospheric components are introduced in Chapter 3; whereas, the measurement instrumentation for particulate atmospheric constituents is described in Chapters 4 (aerosol particles) and 5 (cloud particles). Special problems associated with airborne particle sampling are discussed in detail in Chapter 6. The next two chapters deal with radiation measurements for mostly in situ purposes (Chapter 7), and with the objective of passive remote sensing of the Earth’s surface (Chapter 8). The most commonly used airborne active remote sensing techniques are then introduced in Chapter 9. An extensive list of references is given at the end of the book. Furthermore, supplementary material, including a glossary and appendix, has been compiled and is available from the publisher’s website. Selected parts of the book have been published in advance with permission of the publisher and explicit reference to this book (Baumgardner et al., 2011). The target audience of the book is not only experienced researchers but also graduate students which the book intends to attract to this exciting scientific field. 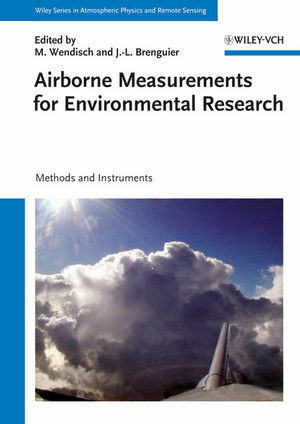 Also university teachers, scientists experienced in other fields and looking for additional airborne data, e.g., for validation or analysis of their own measurements, modelers, and project managers will find a concise overview of airborne scientific instrumentation to explore atmospheric and Earth’s surface properties in this book. We are very grateful for the financial support supplied over many years by the EC. Numerous further funding agencies are acknowledged ... We appreciate the efforts of Ulrich Schumann and Dave Fahey to manage the review process for the book; we also acknowledge their own comments and suggestions. The efforts of technical editor, Dagmar Rosenow, is greatly appreciated, as well as the students, Kathrin Gatzsche and Marcus Kundisch, who where of great help in formatting the text and improving the figure quality. Furthermore, we would like to explicitly list the leading authors of the chapters emphasizing their active role in compiling this book. 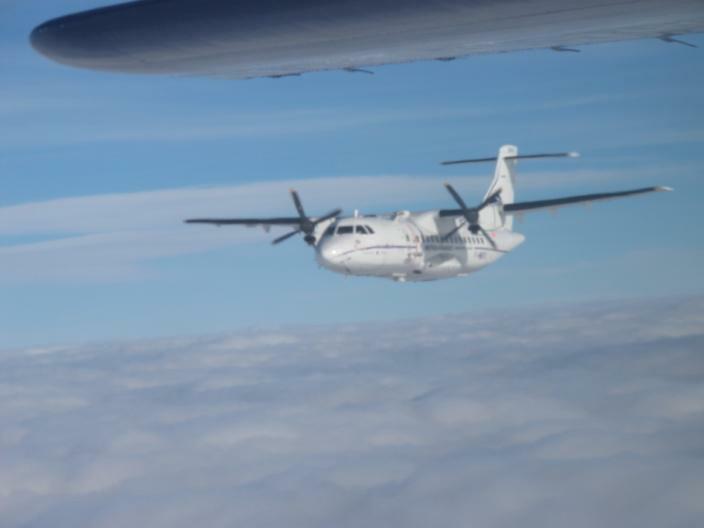 During the first three years of EUFAR FP7, 14 early-stage researchers had the opportunity to join an existing EUFAR transnational access or other airborne campaign. 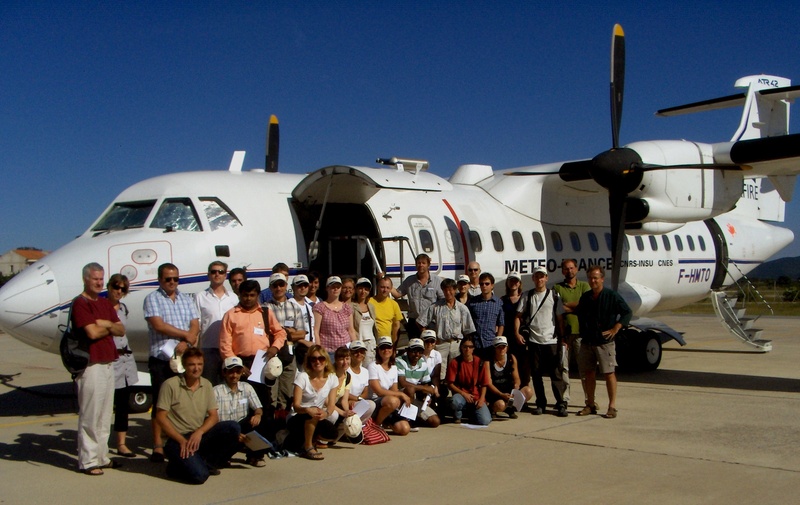 ADvanced Digital Remote sensing in Ecology and earth Sciences Summer School (ADDRESSS), August 19th-28th 2010 , Tihany, Hungary with NERC ARSF Dornier 228 aircraft equipped with hyperspectral imager and LiDAR. Host: András Zlinszky, Balaton Limnological Research Institute (BLRI), Hungary. Training & Education for Turbulence Research via Airborne Data (TETRAD), September 10th-18th 2010, Hyères, France with SAFIRE ATR42 aircraft instrumented for turbulence research. Host: Alessandra Lanotte, CNR ISAC Institute for Atmospheric Sciences and Climate, Italy. Quality of Airborne Data (QAD): October 26th-November 5th 2010 during ICARE 2010 at Météo-France, Toulouse, France with various aircraft of the EUFAR fleet instrumented for intercomparison measurements. Host: Radovan Krejci, Stockholm University, Sweden. School ON Aircraft Techniques for the studies of Atmospheric chemistry (SONATA), August 17th-28th 2011 in Pescara, Italy with FAAM BAe-146 aircraft instrumented for atmospheric chemistry measurements. Host: Piero Di Carlo, CETEMPS, University L’Aquila, Italy. The longer term objective is to consolidate and develop educational material and make it available on-line as supplementary material to the EUFAR book or directly through the EUFAR website. The EUFAR Networking Activity - Standards and Protocols (N6SP) is tasked with creating recommendations for standards and best practices within the EUFAR community. In collaboration with European and international organizations, N6SP has developed standards for data formats (HDF, NetCDF, etc), real-time data exchange and recommendations for data processing. Many of these standards draw from broader initiatives (INSPIRE, Climate and Forecast Conventions, IWGADTS) to ensure broad compatibility. In addition to these standards, N6SP is developing a free, open-source software toolbox known as EGADS (EUFAR General Airborne Data-processing Software), which integrates data processing algorithms contributed by the EUFAR community into a single package. The recommendations, documentation and products developed by N6SP are available on the N7SP Wiki (http://www.eufar.net/cms/standards-and-protocols/). Please see this Wiki for more information. 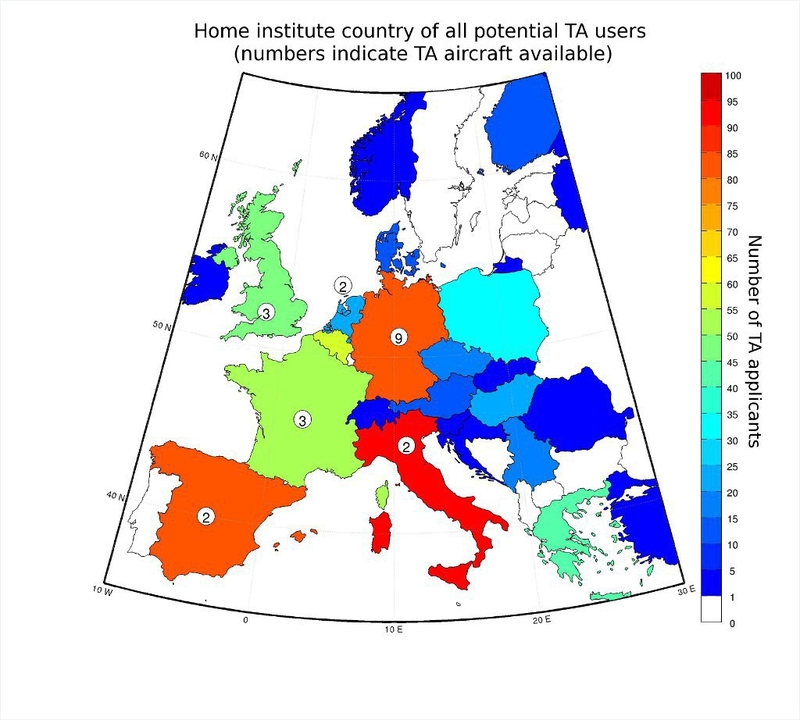 The aim of the database activity is to develop a central gateway to the the data and supporting metadata collected by instrumented aircraft participating in EUFAR TA projects and training courses. This unique portal to the data, connecting to distributed existing archives and a dedicated archive for remaining offline data will improve the access to, and use of this valuable data. 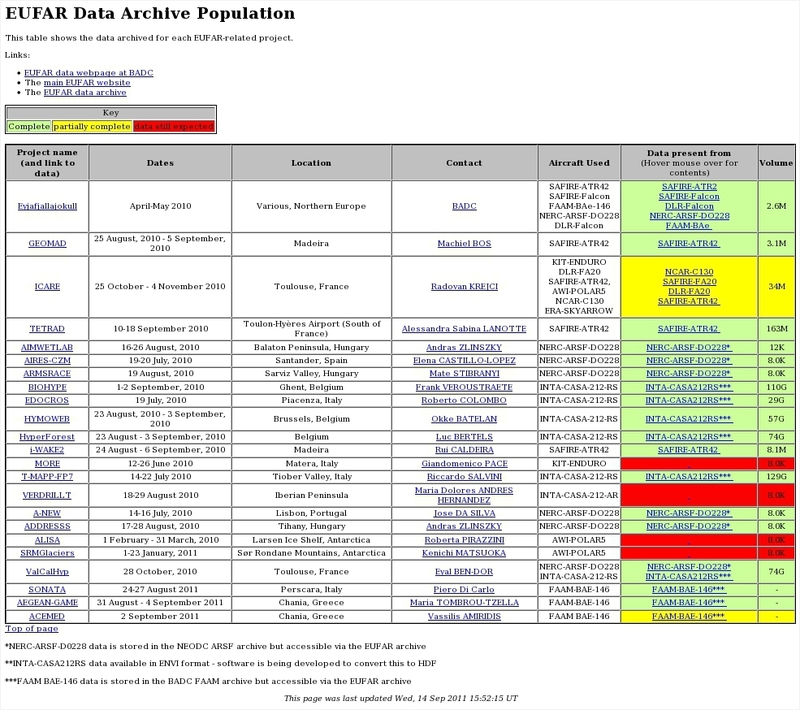 An initial scoping study of the data storage practices of participating EUFAR aircraft has identified existing distributed data archives and offline data sources. A secure online archive has been established at BADC for offline data and a web interface directs users to all data collected by TA projects in this and existing external archives. Currently 4TB of data from 50 flights are accessible through the EUFAR data archive and further data will be added as they become available. Data can be accessed via http://badc.nerc.ac.uk/data/eufar/. Data from TA aircraft are currently stored in a wide range of formats. To promote accessibity and interoperability , and to maximise the potential of EUFAR data collected, community-standard data formats and metadata conventions will be used. A further aim of this activity is to support data providers in attaining these format standards. This service will provide the capacity for “one-stop-shop” access to EUFAR data and will be of benefit to both project partners and the wider scientific community alike. As of August 2011, measurements have been made by 10 aircraft for 19 projects (in addition to the collaboration of data from volcanic ash flights following the eruption of the Icelandic volcano, Eyjafjallajokull, in April 2010). Legal structure models were evaluated as part of the COPAL activities, including the ERIC, the association model and an Memorandum of Understanding (MoU). As no financial commitment has been secured by the COPAL partners for procurement and modification of an European heavy payload and long endurance research aircraft, the decision was made, as planned, to develop a specific legal structure in EUFAR for its long term sustainability. The proposed strategy consists in merging the COPAL and EUFAR objectives to implement Equal Terms Trans-national Access, also referred to hereafter as Open Access. EUFAR is a network of operators and some of them are also research funding institutions. Some COPAL partners are research funding institutions not operating any aircraft which could actively contribute to the EUFAR network. Therefore, it was agreed that the research funding institutions members of COPAL will join the EUFAR network and take a leading role in the N3FF activities for the development of the fleet. These research funding institutions will also play an active role in the joint implementation of Trans-national access (funded by the EU) and Open Access (jointly funded by the EUFAR members). Open Access means that all researchers get access on equal terms to a large fleet of instrumented aircraft irrespective of their institutional affiliation and of which country operates the aircraft. “Equal terms” means that access proposals are selected based on scientific merit only and that financial issues related to the aircraft operation are managed at the institutional level. - to facilitate the transfer of knowledge to the scientists from these countries. For countries already operating research aircraft, the Open Access Scheme agreements can be based on exchange of access between research infrastructures (RIs), as already implemented for research vessels (OFEG). For countries with no RIs to barter, contributions to the operational costs can be made in cash or in kind, for instance by dispatching scientific personnel (contributions in skill) to the operator’s premises. The Open Access Scheme is intended to establish a transparent way of granting access to the facilities forming part of the Open Access Scheme network and to extend access beyond that which already exists, principally by developing the coordination framework that will facilitate access to all European research aircraft. - Drawing up, developing and running a system of exchange and training of scientific personnel between the members. - To implement Open Access. 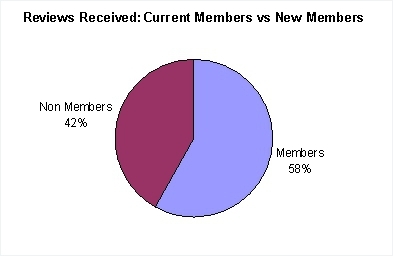 The majority of the COPAL members have agreed on the terms of the MoU which will be signed before the end of September 2011. The monitoring of the activities and their scientific impact has progressed as planned and an updated report has been delivered. In April 2011, the EUFAR coordinator participated in the 34th International Symposium on Remote Sensing of Environment (Sydney Australia) and reported on the EUFAR activities. At the Working Group I meeting, important decisions were made to invite Chinese, Australian and Indian research aircraft organisations to join, to prepare a keynote speech for the Congress in 2012 and jointly (ICCAGRA & EUFAR) held of booth at the exhibition. 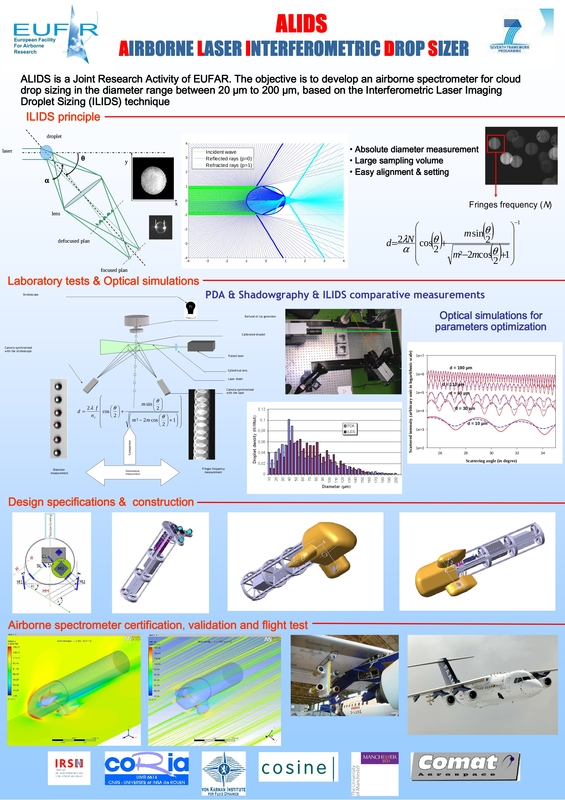 The JRA1-project aims at the development and evaluation of novel compact hygrometers for airborne research (DENCHAR) to be used within EUFAR; including investigations on the sampling characteristics of different gas/ice inlets and the development of an improved ultra fast thermometer for near- and in-cloud measurements. The activity facilitates new instrumental developments together with extensive testing, both in the laboratory and in-flight, include routine operation. In the second reporting period of the project the work has been focused on laboratory and in-flight testing of the four new types of hygrometer using different detection techniques as well as the novel ultra fast thermometer. Extensive laboratory tests of the individual prototype instruments were made at the humidity calibration facilities at FZJ, Jülich. In addition, in October 2010 during a joined laboratory intercomparison campaign (LICC) at FZJ (Juelich), the new instruments have been tested by comparison against each other and against accurate instruments (Lyman(α) and frost point hygrometers). In general, from the laboratory tests the different instruments show good performance over a wide range of humidity levels (10-30,000 ppmv). In first part of 2011 first prototype flight instruments were realised, installed in the Learjet aircraft, and in addition tested successfully during an in-flight intercomparison campaign (IFCC) in May 2011. All data of the different hygrometer are first stored as “blind” data on a DENCHAR-Wiki-website (https://denchar.fz-juelich.de). IFCC-results show good response of the different hygrometers. In fall 2011 the IFCC data will be evaluated, while parallel the work on the design and construction of a small flight package with the new compact hygrometer has been started. In 2012 the flight package will be installed in a Learjet aircraft for a 6 month endurance testing during routine flight operation. The results will be evaluated and recommendations on the use of the new instruments for different airborne applications on board of EUFAR-aircraft will be given. 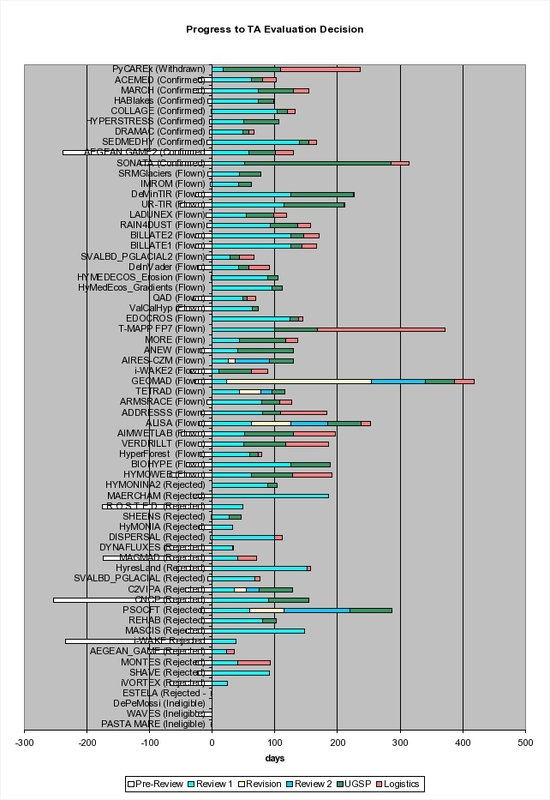 Characterizations of a wall plate inlet using CFD (Computational Fluid Dynamics) were made and will be compared with corresponding in-flight results obtained from IFCC. 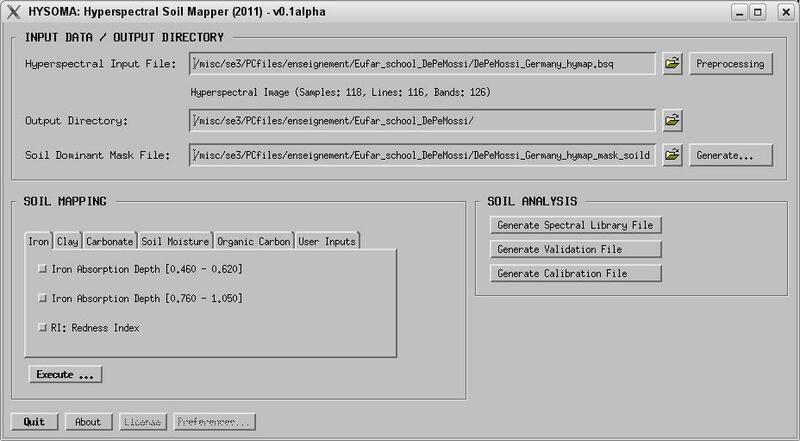 The motivation for the development of the HYperspectral SOil MApper (HYSOMA) toolbox is to provide non-expert hyperspectral imagery users with a suite of tools for soil applications. The HYSOMA toolbox was developed and validated with 18 image datasets and allows to produce 11 soil products associated with different methods for soil moisture content, soil organic carbon content, and soil minerals content (iron oxides, clay, carbonates) for every input image file, plus 1 soil quality layer file, and 4 mask files. The HYSOMA main graphical user interface (GUI) can be found below. 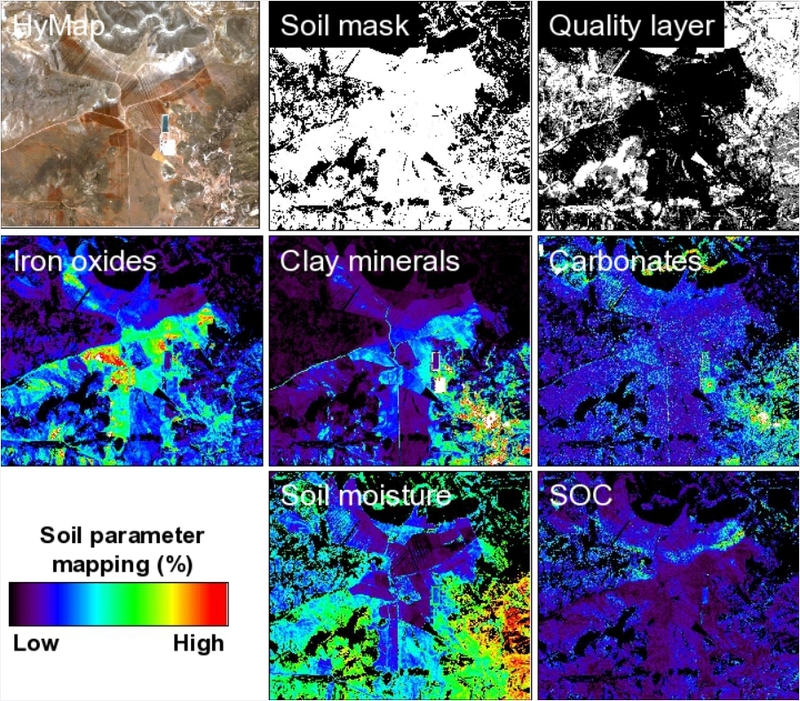 Illustration of HYSOMA generated outputs based on Cabo de Gata HyMap™ hyperspectral imagery can be found below: a) true colour RGB; b) soil mask; c) soil quality layer (black=nominal accuracy, grey=reduced, white=low); d) iron oxide mapping (CRAD 460-620); e) clay mapping (CRAD); f) carbonate mapping (CRAD); g) soil moisture mapping (NSMI); h) organic carbon mapping (SOC1). The longer term objective is to integrate HYSOMA in the EUFAR toolbox to make it more easily accessible to the remote sensing but also non-remote sensing scientific community.